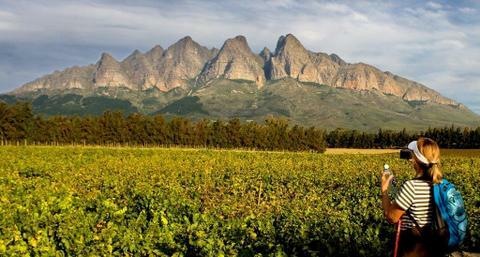 Enjoy hiking through the beautiful Wellington valley in the winelands of the Western Cape – 72 km from Cape Town, South Africa. Local guides, fully accredited and well versed in the history and culture of the area, will accompany you and take you through indigenous fynbos, vineyards, fruit orchards and olive groves. Stop and taste the Wellington wines and olives produced in this fertile valley. Meet the wine-makers and learn more about their award-winning wines. Meet the local characters of the valley and hear their interesting stories. 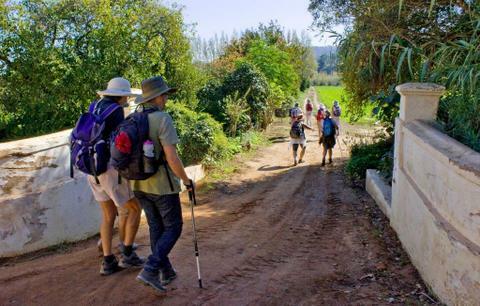 If you love the outdoors, wine-tasting and walking and scenic walking/hiking trails; this is an ideal walking holiday for you. We have a selection of walks to choose from – ranging from 3 to 4 days’ walking. (See the section on Walk options.) Walk at an easy pace and enjoy the scenery as you discover the hidden treasures. All you carry is a light day-pack: we transfer your luggage to your overnight stop. At the end of each day we provide comfortable accommodation in specially selected guest houses, including old historic wine farms which have been modernized and upgraded to South African star-rating standards, each offering delicious country cuisine. We encourage you to form your own party and to book as a group. We have found that the optimum party size is 10 to 14 people (with 2 people sharing a room). The minimum group size is 10 people, and this ensures exclusivity of your party. If you have less than 10 people we will accommodate you by tagging others to your group to secure the required number of people. We can accommodate groups of more than 14 people, but this would be by special arrangement. As the Wellington bowl experiences extreme heat during summer, we have two walking seasons, Autumn and Spring, these periods provide the best walking conditions in the Wellington area.